A cartoony video from the American Chemical Society and PBS Digital Studios oversimplifies the matter of dating rocks. Titled “How do we know the age of the Earth?”, written and delivered apparently by a homosexual who calls a boxer named Rock “dreamy” as if he wishes to “date” him, the video begins with an assertion: “The Earth is 4.565 billion years old, give or take a couple million years or so. How do scientists know that?” The video proceeds to explain radiometric dating in simple terms, leaving only tiny bits of doubt at the end: “Not that they are satisfied, of course; geochemists are still fine-tuning their estimates of the age of the earth and looking for more evidence to support or diminish their theories.” The overall impression, though, is that dates of rocks and meteorites are well established down to four significant figures. As the video admits in the opening sentences, however, “There’s no ‘Established In’ plaque stuck on a cliff somewhere.” And obviously, no human has experienced millions of years, let alone billions. No date can be calculated, therefore, without making assumptions. These include amounts of parent material in the original sample, constancy of decay rates, and conditions that might have altered the rock since formation. Since “earth is an active place,” the narrator explains, there aren’t many samples known that can give earth’s age. For that reason, “Geologists love dating meteorites,” he says. “We might even call them rock stars. They’re like time capsules that crash into the earth.” A hidden assumption there is that meteorites did not undergo alteration in space. That assumption relies on theories of solar system formation. Unfortunately for the overconfident, those theories are plagued with anomalies. Zircon crystals in igneous rocks must be carefully examined and not relied upon solely to predict future volcanic eruptions and other tectonic events, QUT researchers have shown. “One of the assumptions being made is that the composition of the zircons and the rocks in which they have formed give an accurate record of the magmas and conditions at which the zircons and magmas formed,” Associate Professor Bryan said. “From this, we then estimate the age of the event that caused them to form. “But some zircon crystals may not be related to their host rocks at all. They may have come from the source of the magma deep in the Earth’s crust or they may have been picked up by the magma on its way to the surface. “If you don’t distinguish between the types of crystals then you get a big variation in the age of the event which formed the rocks, potentially millions of years, as well as developing incorrect views on the conditions needed to make magmas. Importantly, some widely accepted petrogenetic models can now be viewed as being based on inappropriate assumptions made using these thermometers. We detail here some flawed assumptions made for a few petrogenetic studies, as well as their implications for wider debates in Earth Sciences. It’s not hard to imagine a future paper calling into question the assumptions in this paper. 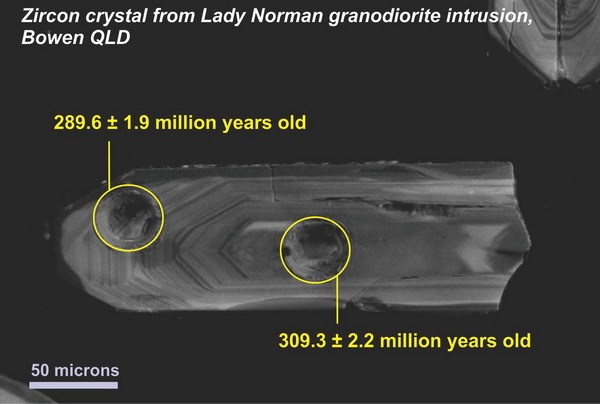 See our article from 3/25/13 about “The trouble with zircons,” which relays information from geological papers that cast doubt on the interpretations given to these “most commonly used” geochronometers. Are secular geologists within the ballpark at least, “give or take a couple million years or so”? ICR’s RATE project found a serious anomaly in zircons recovered from deep drilling. They contained far too much helium from radioactive decay to have been there millions of years; in fact, curve fitting showed them to be concordant with an age of only 6,000 years (see ICR article). 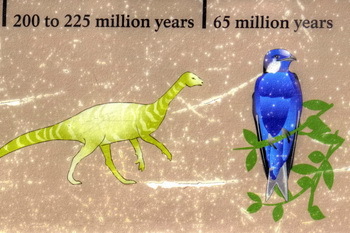 This wipes out the evolutionists’ date, including the error bars as well. Another interpretation of the helium results suggests accelerated nuclear decay had occurred at some time in the past (ICR), though a mechanism for that is still unknown. One theory proposed by Walt Brown suggests rapid production of radioactive elements through a known nuclear process called the Z-pinch (layman explanation at Real Science Radio). Our purpose here is not to choose between alternative models, but to show that alternatives exist, and are even mandated by anomalies in the observed data compared to evolutionary theories. The main point of this entry is the importance of distinguishing fact from interpretation, especially when analyzing confident-sounding presentations made for a less-discerning public. Secular geologists are highly motivated to make things look old, because their idol, the Bearded Buddha, needs the time to work his magic.